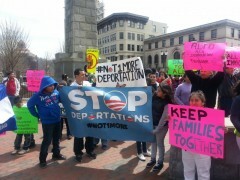 Asheville protest demands end to deportations | Fight Back! Asheville, NC - Amidst the backdrop of continuing congressional inaction on immigration reform, over 100 community members gathered at Saint Lawrence Basilica and marched to the courthouse, demanding an end to deportations and full legalization for all families. The Asheville chapter of Coalición de Organizaciones Latino-Americanas (COLA) joined over 80 cities taking part in a National Day of Action to End Deportations on April 5, organized by the National Day Laborer Organizing Network (NDLON). With patience worn thin from discarded political promises, the marchers chanted "Hey Obama, don't deport my mama!" Protesters held signs that said “Liberation not deportation” and “ICE out of our communities,” with the hashtags #Not1More and #2Million2Many. Several speakers relayed their experiences dealing with the deportation of family members. “More than 1000 people are being deported every day and President Obama has the authority and the power - he can definitely do what’s right,” said Bruno Hinojosa, a member of COLA. Speakers explained that, despite promises to take action on behalf of immigrants, President Obama has instead functioned as deporter-in-chief.